I was more than happy with Premiere CS 3 on my aging PC and I wouldn’t have upgraded right now – had I not discovered the amazing world of Macintosh. I’ve tried my share of virtualisation options but I find that approach a bit clunky for creative endeavours (albeit impressive). Since I’ve already side-graded to the Mac versions of Photoshop CS 5 and Dreamweaver CS 5.5, all that’s missing in my arsenal is a good video editor. Getting tired of learning new platforms every six months, and hearing too many mixed reviews about Final Cut X thought I’d stick with what I know. I’ve been a Premiere user since version 5 (when it wasn’t CS) so that’s been well over a decade now. With today’s powerful hardware there has never been a better time to edit high quality videos on laptops. CS 3 had its faults but when you know what makes it “not crash” you can get by well. Importing files with odd codecs and mixing them on the timeline really doesn’t play well with CS 3. I’m thinking of footage from my plastic cameras like the Harinezumi or my Keyfob jobby here. When CS 4 came out we got it at work, and one of the major changes was the addition of Media Encoder. I loved it but not much else had changed. There had been more export presets and codecs, many of which we never touch due to specific client requirements. We are using Media Encoder so much these days, probably a hot property across the industry – so I’m very happy about the changes I can see in CS 5.5. In comparison to CS 3 and before, you could only work on one file at a time – when Premiere was encoding, you couldn’t setup your next job (i.e. go back into the timeline and edit). This seriously slowed down workflow. Media Encoder is a queue which you send a job to and start it at your own leisure. Since it’s a separate programme, you can keep editing while the encoder does some work. That’s great already. But the new Media Encoder is like having Pro Coder thrown in with Premiere – that alone is worth the money for the upgrade! 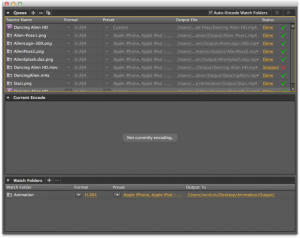 Media Encoder is now a standalone programme that can be used with files other than Premiere Projects. This is huge! It loves to batch encode anything – which is such a helpful feature for a chunk of files your client brings along on a hard disk and demands they need to be done by tomorrow morning. No problem: drag them into a watched folder, hit “start queue” and let the computer burn the midnight oil. It also gets less in the way as Media Encoder CS 4 did (or so I find) and it’s super speedy, yet takes a back seat while you’re working on other applications. And I’m on a 13″ laptop here! Under File Export – Media, you set all your video and audio parameters, as well as where your output file should live – but with one incredible addition: you can now also tell Premiere where to FTP the file! This my friends is big news: it means Premiere CS 5.5 is now becoming something comparable to Content Agent. Not exactly something we associate with video editing but rather a file delivery suite. The Export to Tape option is still there by the way – it’s been removed from Final Cut X but the broadcast industry is far from tapeless even in 2011. This has caused major uproar among Final Cut Pro editors who are probably as confused about X as I am: Are Apple abandoning Pro and Studio? Is X an amateur version? If so, where does iMovie fit in? Let’s not worry about this for now. Premiere Pro CS 5.5 can export to tape, that’s all we need to know at this point (and before you ask, it’s greyed out because I haven’t got a tape deck attached to my laptop right now). This is such a welcome addition to my vast DV tape library that needs some transferring, weeding out and cutting down. You can of course import from tape as well – as before either via FireWire or a connected HD-SDI card. Thanks for the review. 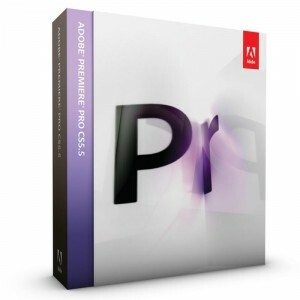 I am currently using Final Cut Express, but with the mixed reviews of Final Cut X (imovie pro) I just purchased a copy of Adobe Permiere 5.5 at a discounted price.